It has, recently, been brought to my attention there is very little information on the Internet about the equipment used in Drive-Away. Equipment like my boom or Joe’s trailer. Costs, availability, additional tools or supplies needed, cost effectiveness of the boom or trailer. Many questions have been raised and I will attempt to answer these questions over this and upcoming posts. Since my bazillion photos are home I will have to start with what I have on hand here. The collapsed boom is a little over 8 feet long. When fully extended the length is 15 feet. The cost of the boom, brand new, is approximately $8,000 USD. The boom set up includes the following items. A 4 inch diameter hydraulic cylinder with 12 inch stroke. Capable of lifting 24,000 pounds at 2,000 psi hydraulic pressure. A 12 volt DC hydraulic power pack with a 4-Way spool valve which powers the cylinder up and down. 20 feet of power cable with alligator clamps enabling attachment to battery posts. This power cable works the hydraulic pump. 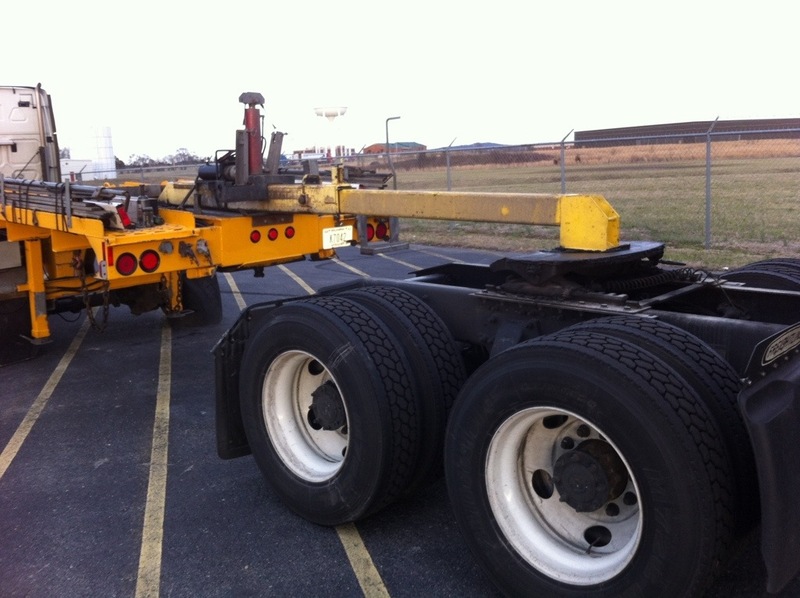 2 – 20 foot 5/16 inch carry chains to secure the rear axles of the towed truck. 1 – 10 foot 3/8 inch Grade 100 (strongest 3/8 chain made) “Carry Chain” which secures the boom to the back truck via a yoke assembly. 1 – 15 foot Grade 100 lifting chain that mounts to the frame of the back truck and over the hydraulic jack. 1 – Specialty Heavy Lifting hook assembly featuring two hooks to secure the lifting chain. More about these chains will be shared in another post when I have pictures. 1 – 60 foot 7 wire electric cable. 1 – 60 foot 3/8 airline. 1 – Crossover yoke to hook the brakes up on any truck. An assortment of coupling bullets to enable the yoke to attach to brake chambers of the towed truck. A set of quick disconnect airline adapters specially made for some trucks with easily accessible fire wall air lines. A “Christmas Tree” which connects all air and electric lines between both front and back truck. A set of four 5 foot Hickory 1″ x 3″ boards to secure air fairings. 4 Wilton Welding clamps – 2-1/2″ opening C Clamps. To attach the boards to the fairings. 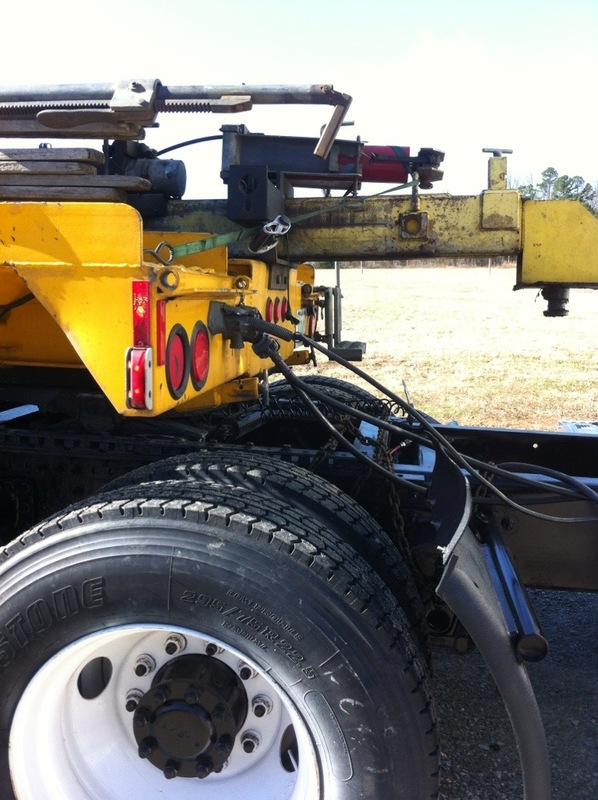 A set of 10 foot ratchet straps to be attached to the clamps, taking the waving and fluttering the fairings do when the truck is pulled backwards. Rubber bungee straps: 2 – 12″; 2 – 15″; 2 – 25″; and 1 – 31″. It has been several years since Joe last built a boom. He will need to get prices on steel and the manufacturing costs. I’ll make sure to have photos of all these items in my next post. This entry was posted on Tuesday, March 5th, 2013 at 8:43 pm	and tagged with boom, collapsible boom, Drive-Away, Tow Away, two way boom and posted in Drive-Away Transport. You can follow any responses to this entry through the RSS 2.0 feed. « Performance stress – otherwise known to me as FEAR. I love learning about this! Is Joe getting ready to build another one? Happy to see your posts again 🙂 I don’t know much about machanical stuffs but always enjoy all the information you share. If I ever need to point someone in this direction I’ll know where to send them. Hope you are well and having safe travels. We have our first snow day of the year so the wild beasties are tearing through the house having a grand time ! !